Correction: My traveling companion was indulging me and posted this for me after I’d written it on the train in another program. It didn’t occur to either of us that it would then bear his byline. This is Mimi Johnson writing, no matter what WordPress says. 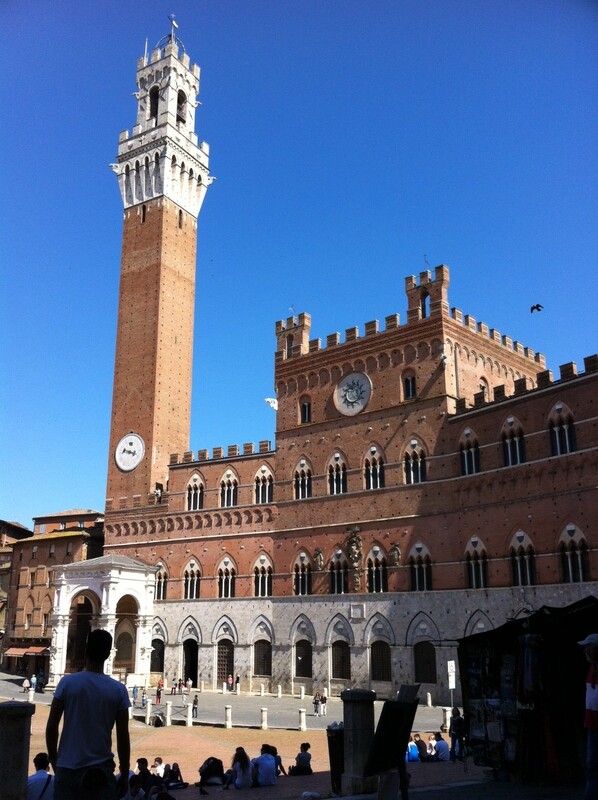 My companion and I reached Siena in the midafternoon, hungry, tired and perhaps a little bit cranky. He’d asked me before we left the states, “Why Siena?” I’d told him I’d just heard it was a beautiful Tuscan city, smaller, without as many tourists as Florence. I thought it was worth a brief visit, a chance to kick back a little and not push the sightseeing quite so hard. 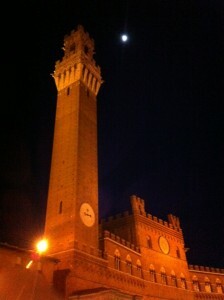 Siena is magical at night. 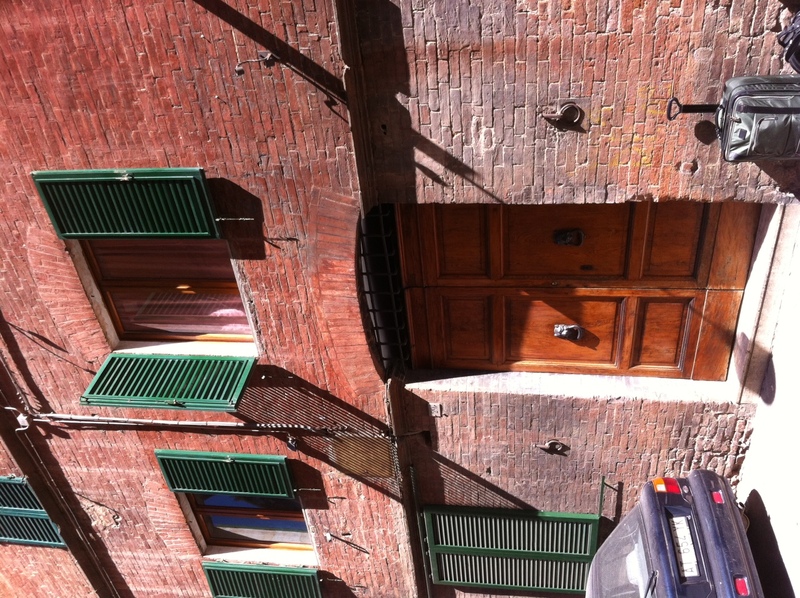 Our B&B was in an ancient, rustic building, the color of, well, sienna. It was just off Il Campo, the lovely center square of the city. After a little snack of bruschetta and a little rest at a sidewalk table, we felt better, ready to wander the narrow, steep streets. We spent some time at the Duomo, lighting candles for each of our families at a side altar. And we stopped by the Basilica of St. Domenico, because I couldn’t resist the chance to see St. Catherine’s mummified head looking down from the altar. I’d read in several places that Siena is at its best at night, and while we were still in France, an acquaintance who’d been there confirmed, “It’s magical.” I wasn’t disappointed. 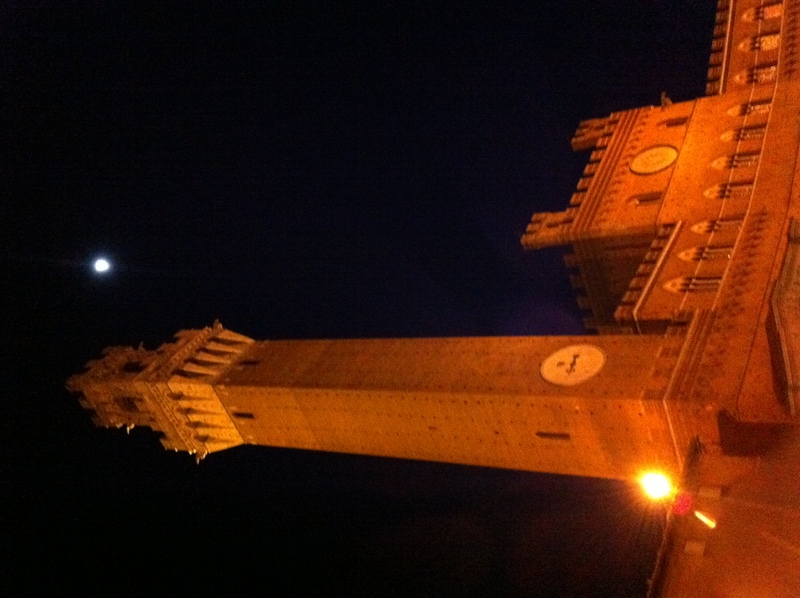 After dark we sat on the cobblestones of the square, looking up at the artfully lit campanile, a half-moon lurking nearby in the starry night. When I looked over at my companion I could clearly see the young man he used to be, when he wooed and won me. Romantic. Magical. Last night, I slept in a building that was built 800 years ago. As I lay in bed, my companion sound asleep beside me, I looked up at the dark wood beams of the dim ceiling far above me, and wondered about all the couples that had shared this room before us. The idea of 800 years of living kept me awake. (Or perhaps it was the espresso I’d had after dinner.) The drunken singing from a group below drifted up from the street, a faint, merry murmur through the ancient, thick walls. 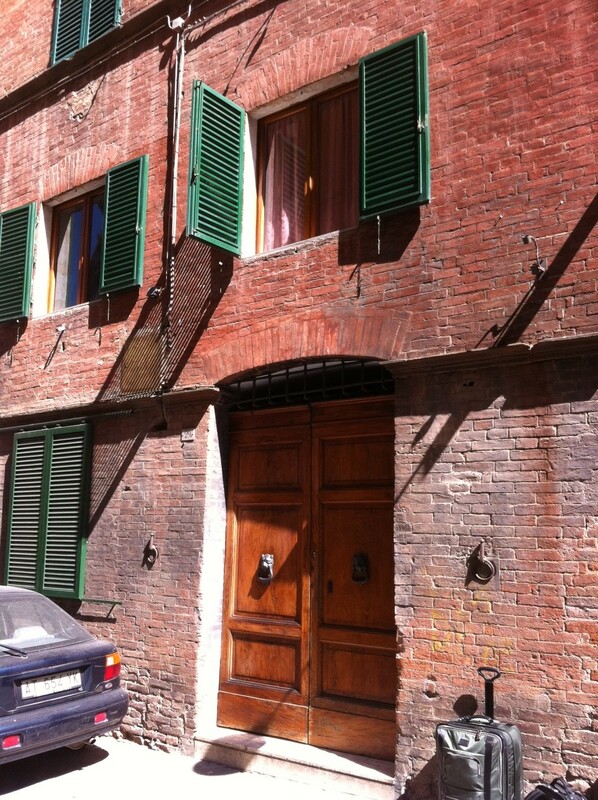 The entrance to the Palazzo Masi bed and breakfast in an 800-year-old Siena building. 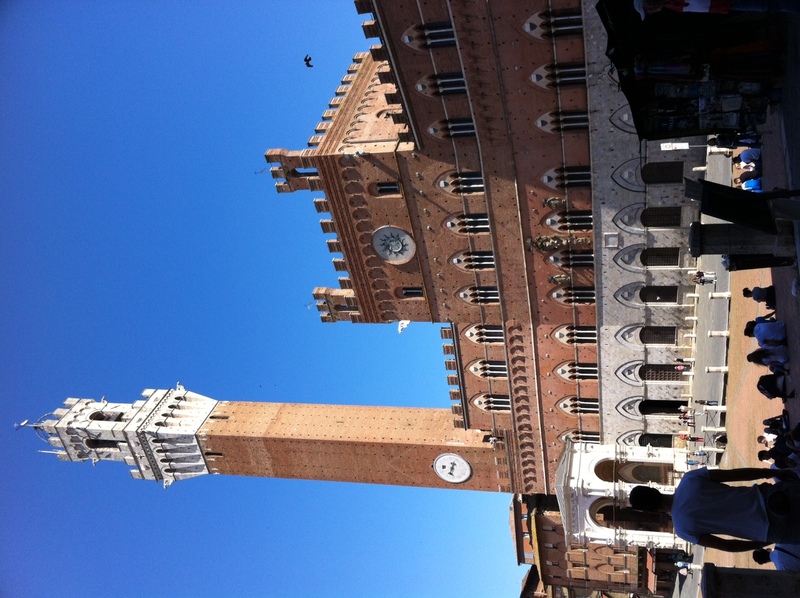 This entry was posted in Europe and tagged Italy, Siena by stevebuttry. Bookmark the permalink. Do I sense an Italian inspired novel in the works? Hopefully it would be better than Grisham’s “Playing for Pizza”. I hope you both enjoyed every second of your time there.